What is the difference between, “fresh Atlantic salmon” on sale for $7.99++/pound and right next to it “Wild Pacific Sockeye salmon” for $14.99++/pound? Does it really matter which salmon you buy? 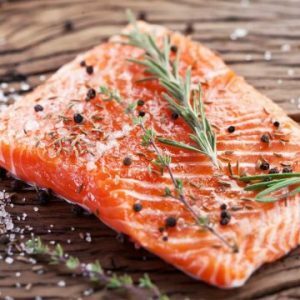 In this article, we’ll look at the differences between farm-raised salmon and wild caught salmon so you can be the judge. Farm raised salmon are fish raised at engineered aquatic farms. Virtually all salmon sold in North America labeled as “Atlantic” comes from farms, because the majority of the natural habitat of fish on the eastern side of the United States of America are no longer abundant. There is one major exception that i will detail at the end. Surgically extracted salmon egg and sperm are used to create a new fish. Fish eggs are incubated and hatched. Fish babies begin their lives in controlled freshwater environments. Salmon are exposed to increasing levels of salt in water, which is not natural. Fish are vaccinated against infectious diseases before they enter a pen with tens of thousands of other fish. This is also not natural and we absorb these vaccinations somewhat when we eat the fish. Salmon is fattened up on a concentrated, high fat combination of ground up fish, fish oil, and grains. The food pellets also have color additives that help give the farm-raised salmon the nice pinkish color we’re all accustomed to. Otherwise, they’d be a dullish grey color. Wild salmon, by contrast, obtain their pink hue from their natural environment by feasting on a diet of krill, which eats red algae. When the salmon weighs 8 – 10 pounds they’re killed, packaged, and shipped to your neighborhood grocery store. Farm raised salmon gets its color from food additives. One of the most common dyes used in fish feed is called canthaxanthin. This compound may cause eye defects and retinal damage. As a result, the European Commission ordered fish farmers to reduce the use of canthaxanthin, and the United States requires labels to identify farmed and dyed salmon. Polychlorinated biphenyls PCBs are mixtures of up to 209 individual chlorinated compounds (known as congeners). There are no known natural sources of PCBs. PCBs are either oily liquids or solids that are colorless to light yellow. PCBs have been used as coolants and lubricants in transformers, capacitors, and other electrical equipment because they don’t burn easily and are good insulators. The manufacture of PCBs was stopped in the U.S. in 1977 because of evidence they build up in the environment and can cause harmful health effects. However, PCBs persist in the environment. Fish absorb PCBs from contaminated sediments and from their food. One of the biggest debates when it comes to farm raised salmon and how it affects your health is the issue of polychlorinated biphenyls (PCBs). PCBs are synthetic chemicals that bio-accumulate in the fat of marine animals. PCBs were banned in the United States in 1976, but they still get released into the environment at toxic waste sites (like fish farms). The Environmental Protection Agency says that PCBs “probably cause cancer in humans.” But several other studies dispute this. One fact is for certain though: research has shown that women exposed to high levels of PCBs are more likely to have babies born with neurological problems and developmental delays. Women are encouraged to eat fish during pregnancy to help develop the brain tissue of the fetus, unknowingly there are many women consuming harmful chemicals in farm-raised fish. Harvard Medical School nutrition specialist George Blackburn, M.D., Ph.D., noted in the Journal of American Medical Association that in most cases the levels of PCBs found in farm raised fish are low enough that they’re not going to cause harm. But a group of Cornell researchers found that levels of pesticides, dioxins, PCBs and other contaminants were up to 10 times higher in farmed salmon than in wild Pacific salmon. Three additional substances that may be carcinogenic (cancer causing)—dioxins, dieldrin, and toxaphene were consistently found in farmed salmon. The researchers and the Environmental Working Group recommended that most people should eat no more than one serving of farmed salmon each month. Why do Farm Raised Salmon contain more PCBs than Wild Salmon?? Fishmeal/Feed: Studies found that the fishmeal fed to farm raised salmon is highly contaminated with PCBs. They are logistically closer to the sources of PCBs. Farm Raised salmon are more fatty fish and bigger in size. PCBs are stored in fat and remain there for an extended period of time, therefore farm-raised salmon contain more PCBs. Wild Salmon vs. Farm Raised Salmon? David Suzuki Foundation: In January 2001, BBC News produced a program “Warnings from the Wild, The Price of Salmon”. The program cited a pilot study conducted by Dr Easton with David Suzuki Foundation. The study found that farm raised salmon and the feed they were fed appeared to have a much higher level of contamination with respect to PCBs, organo-chlorine pesticides and polybrominated diphenyl ethers than did wild salmon. It concluded that it seems that contamination in farm fish comes from the feed. EWG Report: In July 2003, the Environmental Working Group EWG released a report stating that farm raised salmon purchased in the United States contain the highest level of PCBs in the food supply system. In the report, EWG reported that farm raised salmon have 16 times the PCBs found in wild salmon, 4 times the levels in beef, and 3.4 times the levels in other seafood. EWG recommends that consumers choose wild salmon instead of farm-raised salmon, and they should eat an 8 oz serving of farm raised salmon no more than once a month. Science Journal: In January 2004, the journal Science warned that farm raised salmon contain 10 times more toxins (PCBs, dioxin, etc.) than wild salmon. The study recommends that farm raised salmon should be eaten no more than once a month, perhaps every two months, as they pose cancer risks to the human beings. Health Canada: The current Health Canada’s guideline for PCBs in fish is 2 ppm. EPA: The Environmental Protection Agency guideline on PCBs is much stricter. They recommend that fish with PCBs level between 0.024 to 0.048 ppm should be eaten (8 oz) no more than a month. What does this mean? There is an obvious discrepancy in the limit set by various health agencies. Dr Mark Woodin of Tufts University noted that even if the strict EPA guidelines were known to be the right ones, they are based on the amount of PCBs that are thought to be capable of causing one additional cancer case in 100,000 people over a 70-year lifetime. The use of antibiotics is another hot topic in farm raised salmon operations. Industrial salmon farms use antibiotics to prevent fish from infecting each other with various diseases. This means when you eat farm-raised salmon, some of those antibiotics and other substances enter your system as well. This, in turn, may lead to antibiotic resistance. Antibiotic resistance is dangerous to all human especially children and elderly. This can create “superbugs” of untreatable diseases. Industrial salmon farms expel a steady stream of waste and sewage into surrounding waterways. Parasites and diseases from salmon farms can spread to wild fish. Salmon farms in Scotland alone produce nitrogen wastes equal to that of nine million humans. And yet another issue is the fact that millions of salmon raised in farms escape. This can wreak havoc on wild salmon and affect their feeding and spawning behavior. Finally, another environmental concern with farm-raised salmon is the amount of food required. It takes three pounds of wild fish to grow one pound of farmed salmon. This means farming salmon is an extremely inefficient and unsustainable way of producing food. When a food becomes in high demand the integrity of production, farming and processing tends to decrease to save money and mislead the consumer. Coastal watersheds are among the most important biological ecosystems on earth. An abundance of healthy, wild salmon is a vital component to many of these ecosystems. Mother salmon swims up a river or stream for about two months and finds a spot to lay her eggs–as many as ten thousand at a time. One or more males fertilize the eggs. The salmon eggs hatch in 3-5 months. The baby salmon begin to eat. And most of them are eaten. The one in a thousand who live begin to swim upstream. Once the salmon get big enough, they start to move downstream. The salmon nears the ocean, acclimates itself to saltwater for several days, then enters the ocean. The salmon feast on an abundance of krill, which turns their skin pink due to the red algae the krill eats. At this point the salmon either fattens up for at least two years, then swims back upriver to spawn (sometimes over 1,000 miles). Or, a fisherman catches it in the ocean, freezes it, and then ships it to a restaurant or grocery store near you. There is one major exception in the farm raised category. This farm is in Scotland and can be found at http://www.scottishseafarms.com/. Here the salmon are raised in the cold Atlantic Ocean in a hundred square mile area. They are fed no food and given no medicine. They only eat what is available in the ocean, mostly krill. When eggs are laid they are moved so they are not eaten and gradual moved back to salt water of the Ocean just like in nature. The ocean waters and Salmon are tested constantly for metals and other toxic elements. This is the only farm in the world that we found that is as natural and healthy as fresh caught and that is what we are proud to use and make available to our customers. Yes, you’re going to pay a little bit more. But you are avoiding toxins, cancer causing agents, and environmental concerns.